Finishing your basement is a rewarding experience you'll want to take advantage of sooner rather than later. Although finishing your basement after you've moved in and have lived in the home for a while is always a possibility, you might find it more expensive than it would be if you'd just finished it at the beginning. With that in mind, here are eight reasons why you should consider incorporating a basement development in your new home build. You'll be happy to know that new home builders in Alberta offer a great home warranty and that warranty extends to finished living spaces below ground. If you were to finish your basement after your new home is built, you won't have the same coverage. Having this area covered under warranty will help ensure your basement has as much protection as the rest of the home. Finishing your basement from the start means you can avoid costly repairs down the road and have the confidence in a home warranty that shows the builder stands by their work. If you were to hire a contractor to modify your basement and something were to happen with their work, it's not the builder's responsibility anymore. It's always better to be safe than sorry, especially when it comes to the coverage on your new home. Having your basement finished after the fact can take more time and money than you might expect. It can also cause disruption and inconvenience in your everyday life. Imagine having to tip-toe around a construction zone in your basement for several months. Having a finished, clean basement area from the time you move in will save you a lot of time clearing everything up. 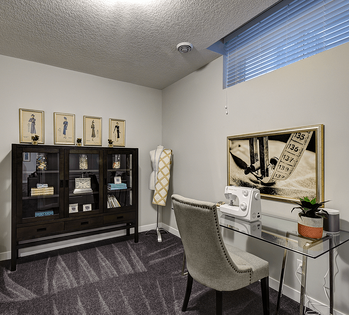 Whether you have friends that want to stay with you from out of town or you need to care for an elderly parent, a developed basement can offer a customized space that allows you to comfortably accommodate your guests. This separate living space will allow your guests to enjoy more privacy instead of feeling cramped or that they're in the way. Some basements can even be developed to include a bathroom and small kitchen area for added functionality as an extra living space. Multigenerational households are common these days, and if you’re looking for a place that will give your parents some independence along with the security of having family nearby, a finished basement is a great arrangement. Your family can have the privacy you want, but you’ll feel comfortable knowing that your parents are close by. A retired parent living downstairs can help out by paying some rent or offering childcare. As another option, an older child starting their adult life may appreciate the opportunity for independence along with more affordable rent. If your child is still in college or hasn’t yet found a job that can fully support their living expenses, a secondary suite can give them the space they need before they leave the nest for good. 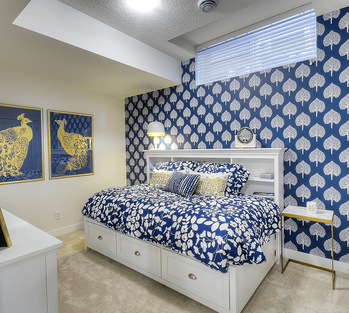 Developed basements are also ideal for growing families who plan on having more children in the future and don't want to relocate to another property in the future. This gives parents peace of mind knowing each child can have their own room in the home and that space won't be limited, even with a larger family. Any quality builder can refinish the basement the way you want it. For many families, the choice to finish the basement is about creating more living space. 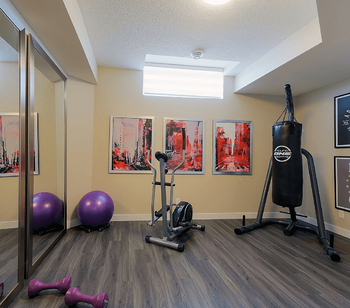 The basement becomes a game room, a home theatre, or an exercise room. Sometimes, it becomes all three. 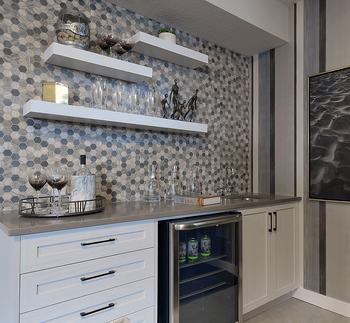 A secondary suite is a different story. When you choose this option, the builder creates a fully separate living area that includes a bathroom, a kitchen, and a separate entrance. It’s a small apartment underneath your home, and this extra space can be a big bonus. Many people use the secondary suite as a source of rental income. Since the unit will be brand new and feature all of the latest amenities, it will retain a strong value in the rental market. While it’s important to remember that it may be vacant as tenants leave and you search for new ones, this extra income can make buying a new home more affordable. To learn more about rules and regulations for secondary suites in Calgary, visit the City of Calgary's Home Improvement Hub. For most, the task of finding the right contractor to perform a job is one of the most time-consuming parts of deciding to do renovations. One of the things you can expect from having the basement finished at the time of building is to have everything done with the same level of care that would be shown in the rest of the home (same style, design, materials, etc). Because experts you trust are involved right at the beginning, you'll be spared the search to find someone at the right price with a good reputation. As mentioned, one of the unexpected complications associated with finishing your basement later is having an inconsistent style, where your basement is a mismatch with the rest of the home. Tile, flooring, and countertop choices are discontinued often, meaning you may have to work with "close" matches. Finishing the basement at the time of building helps you make sure everything blends perfectly. Take the guesswork out of your basement finishes and get it done right the first time with a new home build. You'll be glad you did. A basement that's finished at the time you have your home built will have the price included in your monthly payment. Making this choice will spare you having to pay for the basement with a second loan (which also means having to pay interest) or tapping into your savings. In fact, on a mortgage payment, you'll barely notice it. One of the other benefits you'll undoubtedly welcome is an increased home value. Should you decide to sell at a later date, you'll be able to enjoy the possibility of keeping a higher sale price. Asking your builder to include a basement development in the model you love will spare you the difficulty of taking care of the work on your own. The sooner you get in touch with a builder, the sooner you can start enjoying your dream home complete with a finished basement. 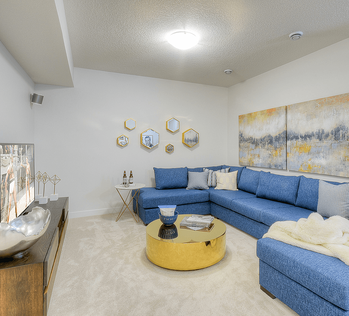 Visit one of our show homes today to see what you can do with your finished basement space! Originally posted June 28, 2016, updated February 5, 2019.